A nice yarny blob, err, I mean, blog! 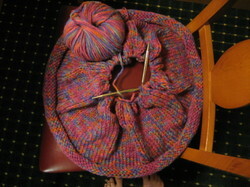 Here's the photo of the fuschia bag in progress I meant to post the other night. I've made a bit more progress but it doesn't really look any different today....still a nice yarny blob. I need to start my research and note-making about how to, um, turn the corner and make the bottom of the bag. Saving my knitting from frogging is one thing, designing is another. Another brand new adventure. Before I start my laundry, baking, and other tasks, I wanted to share this from the new Garnet Hill catalog that arrived in this week's mail. The catalog was full of knitted, crocheted, or other hand-crafted items. Isn't this scarf cool? And how about this afghan? It reminds me of a cathedral window quilt. Not that I've made one....yet. And really, I don't need to start a crochet project either. Copyright Angie L. Simon 2006 - 2018. All rights reserved.